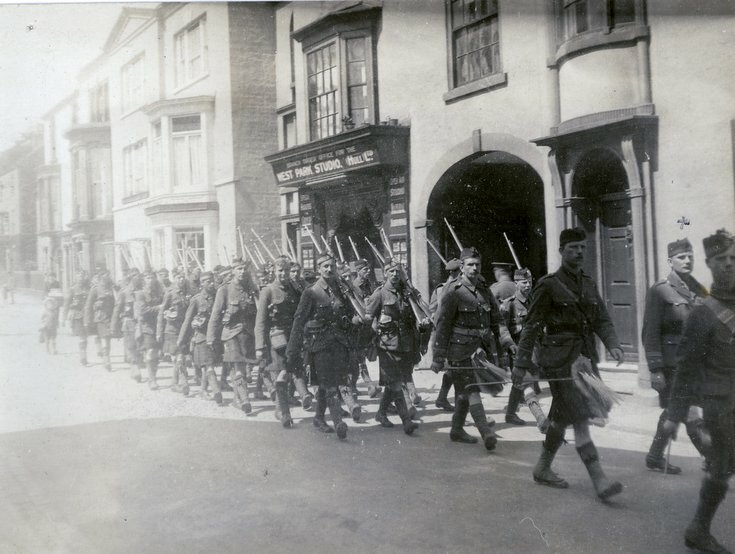 Monochrome photograph of the 5th Seaforth Highlanders marching through a town. Lieut W A MacDonald is second from the right marked with a cross above his head. I don't think these men are off to France. I have seen photographs of that day and the men are heavily laden with kit. Note they are wearing 1914 pattern leather equipment and carrying obsolete Lee Metford Rifles. This marks them out as war time recruits rather than pre-war territorials. The chap at the right hand side is a drummer so they may be following a pipe band but the lack of kit and crowds points to this just being a march through town. It may well have been a march through Bedford but I disagree that these were war time recruits as Lieutenant WA Macdonald was my grandfather . He was a territorial and went off to war from Dornoch in August 1914 . He was killed on 23 July 1918. This photograph was definitely not taken in Bedford. Some clues: 1) the architecture is 'wrong' for Bedford 2) One of the men is wearing a balmoral bonnet (not the tam o'shanter which replaced the Balmoral later) which started to replace the glengarry sometime after the 5th Seaforth had left Bedford to join the fighting in France / Belgium and 3)the shop sign in the background reads West Park Studio (Hull) Ltd. So, I think Adam Brown's right, these are wartime recruits on a route march. I suggest that Lt MacDonald could well have spent some time back in UK assisting in the preparation of new intakes of men before going back to rejoin the fighting. This was not an unusual practice. Sign above shop :- West Park Studio,(Hull) Ltd?